I’ve been thinking a lot about a certain word lately. This word sprouted up in my head a few weeks ago like a very determined little weed through the crack in a concrete driveway. It was like an ear worm song. But not a song. Just a word. And I could not get rid of it. You see, this word is a big one for me. That little word cropped up one day while I was standing on a pier looking out over the East River. Sea gulls were calling, joggers were running past, the waves were lapping on the shoreline as a ferry churned past, and I was truthfully thinking about my current writing project. I was thinking about the three miles I had to walk home. I was thinking about laundry. I was thinking of how beautiful the river was, and how much I hope this pleasant weather holds out against the inevitable north east winter. And all of a sudden, there it was. That word. So, dis-empowerment is basically the opposite of this drawing Jane gave me. “She’s a warrior fairy. See her sword? She’s a tough girl,” she explained. I was attempting, in a fairly inarticulate manner, to explain this to my sister at Thanksgiving. She nodded thoughtfully, silently, while I burbled around this concept of dis-empowerment, and words having such huge power in our lives, and trying to figure out who I am and what I really want, and how I really hate it when I walk the piers by the East River and see a big pile of feathers and I know a sea gull got attacked by someone’s fancy bi-breed dog (schnoodles, shnorkies, corpugbulls… it’s all weird to me). I knew instantly what she was referring to, because in our house growing up we didn’t have cable, so we consumed movies from the local video store, and basically any film made from 1989 to 2005 we can identify and quote. I’m not bragging really, but I am saying that if there is a movie trivial pursuit game going on, we’re the gals you want on your team. My sister was referring to the movie Runaway Bride. There’s a scene where Julia Robert’s character talks about how she doesn’t know what kind of eggs she likes. Her preferences and life have revolved around doing what her fiancees wanted and liked. If her partner liked scrambled eggs, then she liked scrambled eggs. If her partner liked poached eggs, she liked poached eggs. So she goes on a quest to find out what kind of eggs she likes. What kind of life she wants. What kind of person she is. “You’re right!” I yelled excitedly at my sister. Because ya’ll, I get that. Because I spent a huge chunk of life being the woman other people thought I should be. Being dis-empowered, even with the small things. Even with eggs. And it sucked. I was not a warrior fairy. I was the dis-empowered, depressed, resentful, dying-inside fairy. So here I am, at 36 years old, trying out metaphorical eggs. And hats. And clothes. And hobbies. And food. And opinions. Here I am, trying to scratch out my identity from underneath the rubble of other’s expectations and demands. I’m at the center of the perfect storm for all this. I’m living in a city that thrives on not conforming. I’m blessed with the time to write and create things I’ve spent years waiting to do. I’m blessed with a husband and daughter who like and accept my un-curated real self. And I feel like magic is happening. Not Disney magic. Real life changing signs and universe-messages. Because now I can know what kind of eggs I like (boiled, thank you very much). I know what kind of books I like (non-fiction, but give me all the fantasy books too). I know what kind of people I want to spend my time with (authentic, balls-to-the-wall honesty or nothing at all). I know what kind of mother I want to be, and what I want to teach Jane (confidence baby, confidence). This week I threw out 2/3 of my closet because I was looking at my clothes the other day and thought, “I bought almost all of this to project an image of myself that’s not even real.” They looked like costumes to me. So out they went. They didn’t fit me anymore. Some literally, but a lot figuratively. They felt bad on my skin. I simply could not wear them anymore. And all of these things that have happened? All of this magic (because I think the word miracle has been so watered down that magic is a better substitute)? It’s the opposite of dis-empowered. It’s the beginning of my romance with a new word. I used to roll my eyes at that word. That was a word for nutty women who were selfish. Those women were crack pots who ran off to join cults and do yoga on cliffs over an ocean. Those were loud and obnoxious people who talked over everyone else and believed their opinions were the best and brightest and only ones. Because at the end of the day, being empowered is about being comfortable in your own skin. Being empowered is being able to hold up your hand when someone is hurting you and saying, “You are hurting me. I am important. You should not hurt me.” And then not letting them talk you out of it. Being empowered is not wearing clothes you don’t like. Being empowered is not believing something that seems wrong to your soul, despite a church or loud person or anyone else insisting that you should silence your inner compass and believe it anyway. Being empowered is knowing what kind of eggs you like, and never letting anyone else convince you otherwise. Jane’s warrior fairy is empowered. 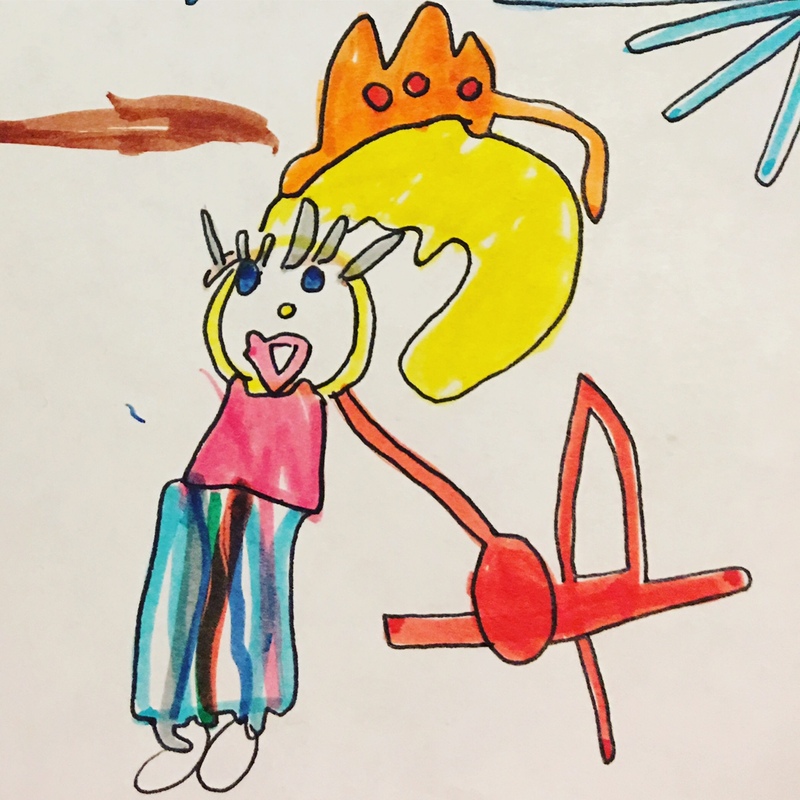 She’s totally herself with her striped tutu and fancy eyelashes (clearly she’s a fan of cosmetics), while carrying her sword with confidence and ain’t nobody going to talk her out of that intimidating crown she’s wearing. I’m so thankful that God led me to that word. I’m so thankful that all the hard stuff in my life led me to that pier, at that time, to learn that thing. I firmly believe that once you are able to put your finger on that pulse, that one word, you are on your way to magic. Once you are able to name the word, to yourself, to the world, and out loud, you are on your way out of the hole and on to better things. Whether it’s dis-empowered, or depressed, or scarred, or scared, or confused, or betrayed… those words want us to find them. And know them. And understand them. And point to them, say them out loud, and begin to heal. That’s when the clothes get thrown out. That’s when we begin the journey to find ourselves. That’s when we pick our favorite kind of eggs. That’s when we become real-life warrior fairies. Yes! To all of this. I was putting on boot socks the other day and some were too tight around my calves and didn’t have enough stretch. This other pair had holes in the toes. Yet another pair was an odd stitching that made the socks cold even though they were thick. I threw them all away. I’m done with uncomfortable. I ordered new socks like the grown up I am. But most of all, it wasn’t the socks that were the problem even. It was me refusing to let go. Glad to see a piece from you. I was wondering how you are. Heading in the right direction, it sounds like. Good on you! Good for you! One role of social work is to approach problems from a strengths perspective (help a person find their strengths). If we try to empower someone that does not work. Everyone must empower themselves and you are doing it. Empowerment brings Integrity and that is one of my favorite words. I’m very happy that you are in a good place with your favorite people 😊. A few years ago a friend of mine was talking about losing weight because if she didn’t then she wouldn’t be able to be the type of old person she wanted to be. That rolled around in my brain a lot. I worry less about my weight than my mom, but I want to conquer bad habits and weed them out. My dear mother-in-law, who has now passed on, never really attempted, as far as I can tell, to weed out the habit of being a worrier earlier in her life. Consequently, as an 80 year old, it consumed her. Becoming an adult, becoming mature in life, relationships, and faith is hard work. (Anyone who says differently is selling something.) The trouble is we think we have to do it all at once, or that we can do it all at fast forward speed. And it doesn’t happen just once either. The clearing out of debris in our lives, physically and metaphorically, takes time, and like the dishes, doesn’t ever end entirely. I need to clean out my closet — again. I cleaned out stuff this summer, and made progress, then school started back and my sister had to start living with us (in-between jobs). Two steps forward and two steps back. Then we have to figure out new stuff. I’m a mom of a 3 year old at age 46. That was not the plan. So, I have to figure out how what kind of mom I want to be — not who everyone else thinks I should be. We clean out again & keep going. Keep trucking, Liz. You clean out one piece at a time. On a purely pop culture note, your post is why the revisit to Gilmore Girls has left me annoyed. The “Rory” of this incarnation doesn’t feel like she knows her own name, much less how she likes her eggs. She lost the ability to know herself somewhere, or she didn’t try to find it earlier — which they don’t explain effectively. You might appreciate a piece of fanfiction called “Ode to an Avocado” if you can find it — because in it, Rory very much sheds others’ expectations of her. Yes ma’am. I don’t believe becoming empowered is a one-and-done process. It’s a life long relationship with yourself. It’s a life long effort to be honest with yourself. In other words, this won’t be the last time I clean out my closet. And oh, but does that ever feel good. AND YES ALL THE YESSSSES ABOUT RORY. I was so upset about her story line. If only there had been a decent backstory to her lack of self and spine, then it might have worked and been good character development. FABULOUS post. I especially love Jane’s take on the whole matter. Empowerment is a lifelong process. Not long ago, I expressed myself to the world in no uncertain terms, and then I thought, “Wow, I would never have had the guts to do that when I was in my 20s, 30s, even 40s or 50s.” I guess I am “mature” now. Maybe that is what you are actually experiencing — maturation. I think it is wonderful that you are at this time and place in your life, and that things are gelling for you. I do love to read what you write, and I think you have lots of great things ahead of you. I am in my 60s and still working at all this! It seems obvious that you have been an empowered mother based on that little gem Jane. Maybe the rest of Liz is just now seeing that, but Jane, well she has been telling you that. Look at her confidence in life, she may be wired this way, but without the environment to nurture, encourage and live with power of self, it would not flourish. She came to the city, conquered because she has an empowered mother that has shown her what that looks like. Welcome to life and eggs and clothes that feel good. Liz, let me introduce you to Janes mother Liz. Thank you ever so much Sandie. That’s the nicest thing anyone could say. At the end of the day I want to be a good example and mother to Jane, and send her out into the world an empowered and thinking-for-herself gal. I appreciate your encouragement so much. I’ve been reading your blog for a long time. But have never commented. But your last two posts have really hit home for me. Thank you for your honest words and transparency. I am currently the disempowered, worn down fairy trying to find out what I want after having my life and what I thought I wanted completely pulled out from underneath me. Again that for your writing and being able to help me to see that there is better things coming and to work towards what I want and not just what others think I should do. You are not alone! Prayers and cyber well-wishes coming your way. There are not enough ‘likes’ in all of social media for your new posts. I am in no way as creatively articulate as you are, but my heart connects with you through your writing. Thank you for your willingness to share your heart and thoughts with all of us. At age 35 I woke up realizing that I had given up who I was to be a wife and mother. I was miserable. It took a few years to bring back into my life the things I loved — jazz, old movies, etc. that I had given up because they had no value to those around me. I became happier with each reclaimed area. Then in my 50’s I decided that I had led my life to other’s expectations of me and I would live the next 50 years to suit myself becoming the woman God intended me to be. At 70 I confess to still evolving with changing priorities and new health challenges. Your last two posts struck loud and clear to me. I’ve had to ‘church myself’ because of toxic relationships within the church community. I’m much more dependent on listening to the voice of God now than I ever was when attending church regularly. He meets my needs now instead of me looking for those needs to be met through people. I make mistakes every day but as I retire to bed I ask for and receive forgiveness. In the morning I request His power for wisdom and strength to get through the day. Sometimes that wisdom comes in the form of knowing what I need to discard (tangible items or thoughts or habits) that are stumbling rocks keeping me from being truly happy. You write so elegantly and put into words so many of my jumbled thoughts and have clarified for me truth. Thank you for continuing to write and willing to be a blessing to so many you don’t know personally. Hubby and Jane are very lucky to have you in their lives — so am I.
Lorda mercy, girl, you are blooming and blossoming all over. I’m glad to be here to watch it. Ohh, this is awesome! At almost gulp, 49, I am finally getting to this way of thinking, I spent too many years being what everyone else needed and wanted – or what I thought they needed and realizing, they want me to be me, not anyone else. Sometimes it is very true and we are letting others shape us, other times we are doing it to ourselves not seeing that other people don’t want that from us at all. Next month I am closing on the type of house I wanted to buy over 20 years ago and happy was exactly what I felt when I walked in that house for the tour – I had to endure everyone along the way question my choice, yes, I DO want a house with a pool thank you very much! It is my happy place and no I don’t want to share it with a community, I want to be selfish and float in peace if I want to or invite the entire neighborhood in to swim too, that’s ok! It is empowering to not let someone else, or many someones tell you you will hate the very thing you always wanted just because they wouldn’t want it. Next I tackle the closet too…I have to pack it anyway and who wants to move clothes that don’t fit who you are? Thank you for sharing your insights and journey – you always inspire.